Rather than let the garden herbs grow out of control, make pesto instead. I have found that it doesn’t really matter how much of which kind of herb you use…as long as you have enough basil in there to give it that basil flare. I did not measure my pesto as I made it…but I’ll tell you what I put in it…and then just added a little salt and olive oil to make it taste just the way I wanted it! Just throw everything in a food processor or blender and mix until desired consistency. Use immediately or freeze for use in future meal. 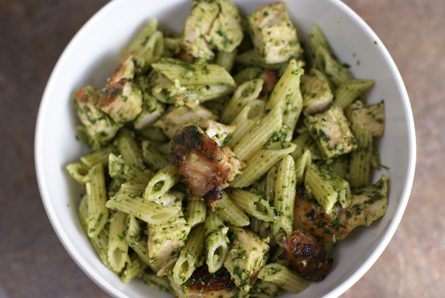 It’s perfect for pasta…Grilled Chicken Spinach Pesto Pasta. 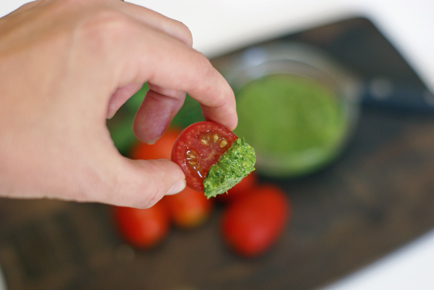 It’s perfect for dipping tomatoes. 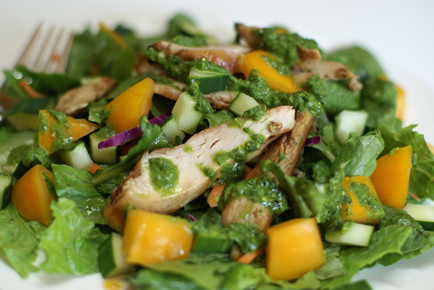 It’s perfect for making a pesto vinaigrette (recipe below). It’s perfect for spreading onto a grilled chicken sandwich. Or you could just drink it out of the bowl. Well, that may be a little much?! Place ingredients in a bowl and whisk. Add a touch of water if needed to get it to desired dressing consistency. Serve with salad. 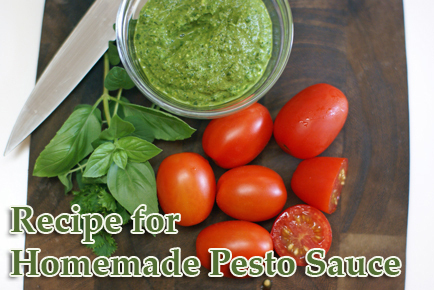 Please share some of your favorite Pesto Recipes!!! Update: be sure to check out the comments below as we’ve got lots of additional reader suggestions for using up pesto! 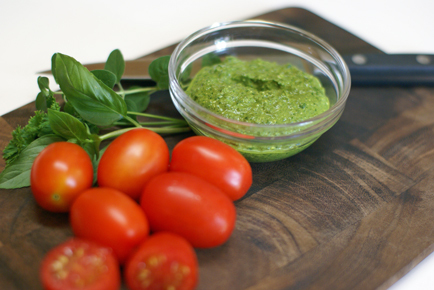 My favorite pesto recipe is to mix pesto with shrimp for a quick and delish appetizer. Serve with a nice french bread. If you have any leftovers, you can toss it with some pasta. for some reason I prefer pesto to sauces like ragu, but its alot more expensive…. I slice up French Bread, brush with olive oil and lightly toast under the broiler. Then rub the slices with garlic, heap on some diced tomatoes and drizzle on pesto. I like to put them back in the oven for a minute (so the tomatoes aren’t cold). Then pull them out and sprinkle with freshly grated parmesan. YUM! Pesto makes the world go round!!! Best stuff on earth, well, besides pizza 🙂 MMMMMMmmm, now I want pesto pizza! 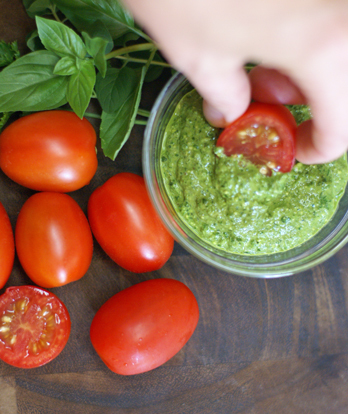 8 oz cream cheese, 1/4 c diced roasted red peppers, 2 – 3 T pesto – mix together. Spread on tortillas and roll up. Chill for an hour then slice into 1/4 – 1/2 inch slices. This has been my most requested appetizer this summer. Totally trying the pesto corn cob!!! YUMM!!! You don’t put parmesan in your pesto? Just herbs and oil? A little lemon juice will help keep the pesto green too. Copying a dish I ate at a pricey restaurant in NYC, I fry up cauliflower with my home made pesto. It’s delicious, especially if you let the cauliflower brown a bit! Love the cauliflower idea! And no…we have a dairy allergy, so I have to leave out the parm. I know, it's a tragedy!!! Wow! The colors really pop on those pictures! 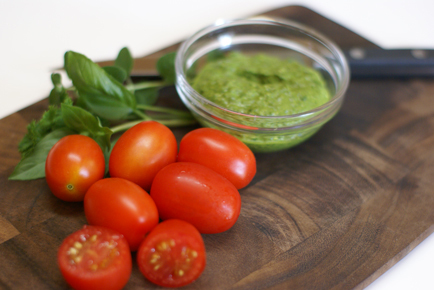 I haven’t made pesto in a while, but it’s one of my favorite things to eat… I’m going to have to make some this week. Thanks for the pesto recipe ideas! I’ve never made pesto, but this post inspires me to try! i’ve been loving my homemade pesto for years. tried the vinaigrette today — thank you for sharing the recipe. it was excellent! i add it to my homemade tomato sauce. i buy a huge can of crushed tomatoes from sam’s. makes 4-6 meals and costs less than $3. I use pesto instead of pizza sauce on my homemade chicken pizza! 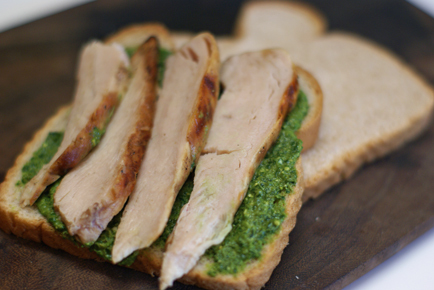 It’s a great way to use up left over grilled chicken, or even turkey at Thanksgiving.